Is the world we see around us real or a mere appearance? If it is an appearance is there a reality behind it? Is that reality divine and what is its relationship with the world? Can man know that reality that transcends the sensible world? Is the knowledge we acquire about the physical world through science valid? These questions have been debated by man since he first began to philosophize. It has not been settled, nor is it likely to be settled once for all to every body's satisfaction. 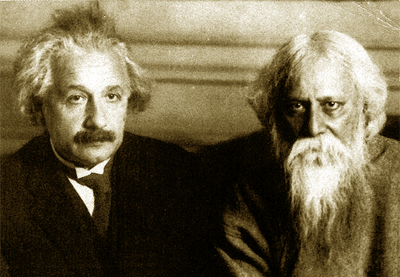 It is however intriguing to know that these very questions came up for discussion during the meeting of two great men - Rabindranath and Einstein. And it was Einstein who started it by asking at the beginning whether the poet believed in the Divine and what according to him was His relationship with the world. Why, of all things, Einstein asked this question? Rabindranath became world famous after he received the Nobel prize in 1913 - a time when the Colonial powers of the West were on the brink of a global holocaust, the First World War, which had its origin in their unprecedented material prosperity from industrial revolution and merciless exploitation of the Afro-Asian countries and their arrogance and insatiable greed. The Western man, so long highly optimistic about his material civilization, grew skeptic about it. Did he seek an answer to his doubts in the works of the poet? The Geetanjali or the Song-offerings of Rabindranath came as a message of hope and consequently he was looked upon more as a God-intoxicated devout man than as a poet. It is very relevant that the young English soldier-poet, Wilfred Owen, who got killed in France during this war was found to have carried a copy of the Geetanjali on his person. Einstein's mind also seems to have been full of these doubts and this seems to be the reason why his opening question was about the poet's religious belief. Moreover Einstein seems to have been occupying himself a great deal with the question of religion at this time and shortly after this meeting he was to publish an article, 'Religion and Science,' in the New York Times of 9th November,1930. Einstein : Do you believe in the Divine as isolated from the world? Tagore : Not isolated. The infinite personality of Man comprehends the Universe. There cannot be anything that cannot be subsumed by the human personality, and this proves that the truth of the Universe is human truth. I have taken a scientific fact to explain this. Matter is composed of protons and electrons, with gaps between them, but matter may seem to be solid without the links in spaces which unify the individual electrons and protons. Similarly humanity is composed of individuals, yet they have their interconnection of human relationship, which gives living unity to man's world. The entire universe is linked up with us, as individuals, in a similar manner - it is a human universe. I have pursued this thought through art, literature and the religious consciousness of man. Einstein : There are two different conceptions about the nature of the universe -the world as a unity dependent on humanity, and the world as a reality independent of the human factor. Tagore : When our universe is in harmony with man, the eternal, we know it as truth, we feel it as beauty. Einstein : This is the purely human conception of the universe. Tagore : There can be no other conception. This world is a human world - the scientific view of it is also that of the scientific man. Therefore, the world apart from us does not exist; it is a relative world, depending for its reality upon our consciousness. There is some standard of reason and enjoyment which gives it truth, the standard of the Eternal Man whose experiences are through our experiences. Einstein : This is a realization of the human entity. Tagore : Yes, one eternal entity. We have to realize it through our emotions and activities. We realized the Supreme Man who has no individual limitations through our limitations. Science is concerned with that which is not confined to individuals, it is the impersonal human world of truths. Religion realizes these truths and links them up with our deeper needs; our individual consciousness of truth gains universal significance. Religion applies values to truth, and we know this truth as good through our own harmony with it. Einstein : Truth, then, or beauty is not independent of man? Einstein : If there would be no human beings any more, the Apollo of Belvedere would no longer be beautiful. Einstein : I agree with regard to this conception of Beauty, but not with regard to Truth. Tagore : Why not? Truth is realized through man. Einstein : I cannot prove that my conception is right, but that is my religion. Tagore : Beauty is in the ideal of perfect harmony which is in the Universal Being, Truth the perfect comprehension of the Universal mind. We individuals approach it through our own mistakes and blunders, through our accumulated experiences, - through our illumined consciousness - how, otherwise, can we know Truth? Einstein : I cannot prove that scientific truth must be conceived as a truth that is valid independent of humanity; but I believe it firmly. I believe, for instance, that the Pythagorean theorem in geometry states something that is approximately true, independent of the existence of man. Anyway, if there is a reality independent of man, there is also a truth relative to this reality; and in the same way the negation of the first engenders a negation of the existence of the latter. Tagore : Truth, which is one with the Universal Being, must essentially be human; otherwise whatever we individuals realize as true can never be called truth, at least the truth which is described as scientific and which only can be reached through the process of logic, in other words, by an organ of thoughts which is human. According to Indian philosophy there is Brahman, the absolute Truth which cannot be conceived by the isolation of the individual mind or described by words but can only be realized by completely merging the individual in its infinity. But such a truth cannot belong to science. The nature of truth which we are discussing is an appearance, that is to say, what appears to be true to the human mind and therefore is human, and may be called Maya or illusion. Einstein : So according to your conception, which may be the Indian conception, it is not the illusion of the individual but of humanity as a whole. Tagore : In science we go through the discipline of eliminating the personal limitations of our individual minds and thus reach that comprehension of truth which is in the mind of the Universal Man. Einstein : The problem begins whether truth is independent of our consciousness. Tagore : What we call truth lies in the rational harmony between the subjective and objective aspects of reality, both of which belong to the super-personal man. Einstein : Even in our everyday life, we feel compelled to ascribe a reality independent of man to the objects we use. We do this to connect the experiences of our senses in a reasonable way. For instance, if nobody is in this house, yet that table remains where it is. Tagore : Yes, it remains outside the individual mind but not the universal mind. The table which I perceive is perceptible by the same kind of consciousness which I possess. Einstein : Our natural point of view in regard to the existence of truth apart from humanity cannot be explained or proved, but it is a belief which nobody can lack - no primitive beings even. We attribute to truth a superhuman objectivity, it is indispensable for us, this reality which is independent of our existence and our experience and our mind - though we cannot say what it means. Tagore : Science has proved that the table as a solid object is an appearance and therefore that which the human mind perceives as a table would not exist if that mind were naught. At the same time it must be admitted that the fact that the ultimate physical reality is nothing but a multitude of separate revolving centres of electric force, also belongs to the human mind. In the apprehension of truth there is an eternal conflict between the universal human mind and the same mind confined in the individual. The perpetual process of reconciliation is being carried on in our science, philosophy, in our ethics. In any case, if there be any truth absolutely unrelated to humanity, then for us it is absolutely non-existing. It is not difficult to imagine a mind to which sequence of things happens not in space but only in time like the sequence of notes in music. For such a mind such conception of reality is akin to the musical reality in which Pythagorean geometry can have no meaning. There is the reality of paper, infinitely different from the reality of literature. For the kind of mind possessed by the moth which eats that paper literature is absolutely non-existent, yet for man's mind literature has a greater value of truth than the paper itself. In a similar manner if there be some truth which has no sensuous or rational relation to human mind, it will ever remain as nothing so long as we remain human beings. Einstein : Then I am more religious than you are! Tagore : My religion is in the reconciliation of the Super-personal Man, the universal human spirit, in my own individual being. This has been the subject of my Hibbert Lectures, which I have called "The Religion of Man."